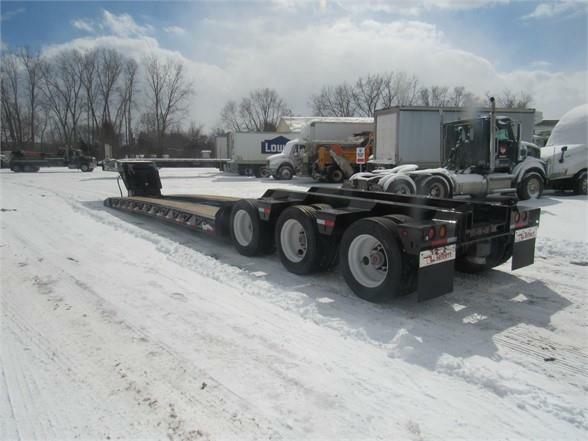 2019.TALBERT.55 TON.HYDRAULIC DETACHABLE.LOW BOY TRAILER.AIR RIDE.TRI AXLE.108 INCH SWING RADIUS.10" FIXED FRONT RAMPS.CHAIN BAR IN NECK.1" HYDRAULIC COUPLERS.BATTERY OPERATED STROBE LIGHTS.26 FOOT WELL.102 INCHES WIDE.18 INCH DECK HEIGHT.2 INCH APITONG FLOORING.12 " T-1A STEEL MAIN BEAMS.BOOM WELL.BUCKET WELL.EXPANDED METAL BETWEEN MAIN BEAMS FRONT AND REAR.25,000 POUND AXLES.54 INCH AXLE SPACING.STEEL HUB PILOT WHEELS.275/70R22.5 16 PLY RADIAL TIRES.AIR LIFT THIRD AXLE.ALL L.E.D. LIGHTS..PAINTED VALSPAR.BLACK.WILL CARRY 110,000 POUNDS IN THIRTEEN FEET !!! !BUILT WITH A 2 1/2 TO 1 SAFETY FACTOR ,WHICH IS THE BEST IN THE INDUSTRY! !GREAT PRICE OF ONLY $64,995.00 PLUS F.E.T.